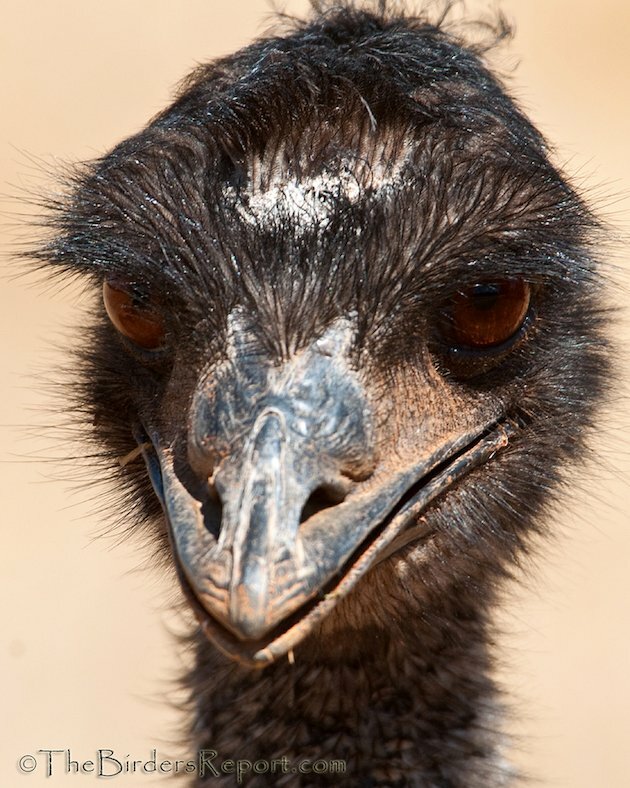 The Emu is the second largest living bird in the world by height, second only to the Ostrich. 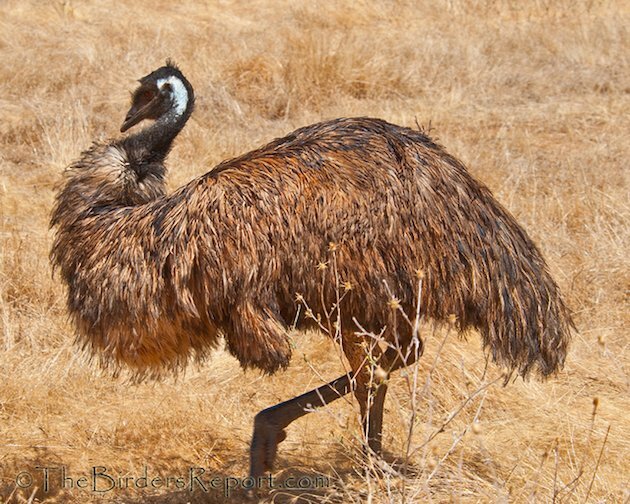 It is also the largest bird native to Australia1. They can be rather intimidating when they are close up and looking at you eye to eye. Click on photos for full sized images. On my way to do some maintenance on the artificial Burrowing Owl habitat we installed in Anderson a few years ago, I spotted a pair of Emu grazing in a large open field. I decided it would be an excellent photo opportunity so I pulled off the main road, onto a side street and turned into a cul de sac. There was a smaller open field on one side and an industrial building of some sort on the other, and a four foot fence in front of me. As I was pulling up to park near the fence, I couldn’t help but notice that the birds that had been hundreds of yards away from me were now nearly at the fence! 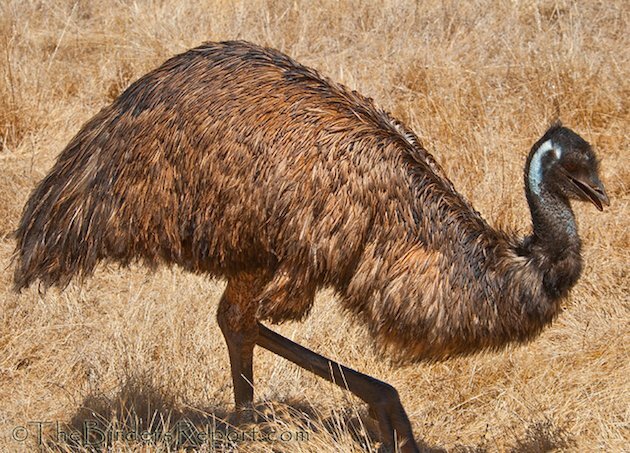 Emus can trot great distances very quickly and reach speeds of 30 mph! By the time I got out of the car with my digiscoping gear, they were too close to photograph. I quickly replaced the scope with my 80 – 400mm lens as the pair watched with curiosity. These birds can reach six feet tall and weight over 100 pounds and their plumage will vary in color due to environmental factors, giving the bird a natural camouflage1. Note how this Emu blends in with the surrounding grassland. The male and female of the species are nearly identical, the female being a bit larger than the male. 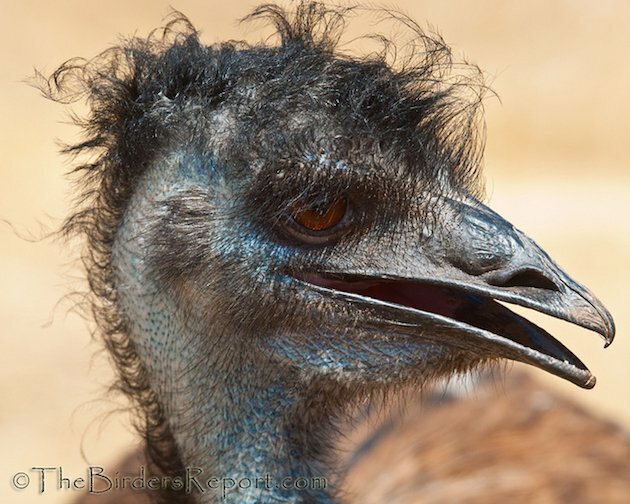 As a departure from the norm, the female Emu courts the male. She will circle him and give a drumming call. This female began strutting around and drumming. Notice how her neck is pulled back and her feathers are more erect as she makes the beautiful drumming call heard in the mating video below. I really enjoyed watching them interact but I guess, since I didn’t have any food for them, they decided to return to their foraging and slowly wandered away. I did find an amusing video of the Emus engaged in a wild dance. And another of a pair mating which includes the drumming sound created by the female. I think they are cute (just look at that do), but they can be intimidating and possess a powerful defense mechanism using their legs, and feet with sharp claws, to kick. 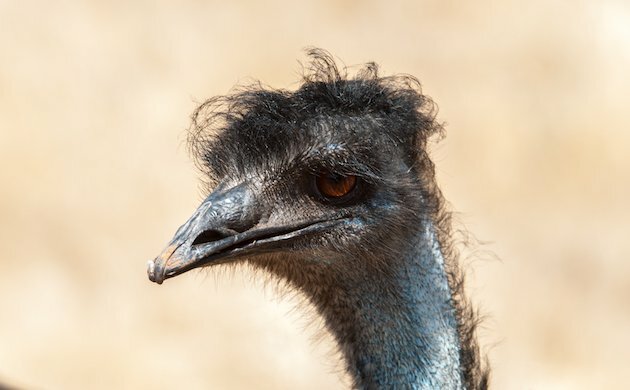 All the information on the Emu in this post was gleaned from Wikipedia (with loads more information) but here are a few other good sources: Unique Australia Animals, the San Diego Zoo, and the Internet Bird Collection. Am I the only one reminded of Prince Philip the Duke of Edinburgh by the top picture?